The Numto Park Station belongs to the UNESCO Chair on Environmental Dynamics and Climate ChangeAccording to the United Nations Framework Convention on Climate Change, climate change is change in the climate of the whole Earth or a region of the Earth that is believed... More at the Yugra State University, Khanty-Mansiysk, Russia. The Numto Park Station is located in Western Siberia (south of Yamal Peninsula), c. 300 km south of the mouth of the Ob River in the regional park “Numto” (63°42’ N, 70°54’ E). The Numto Park Station is a newly built station at the location of the old meteorological station of Roshydromet. The station was officially opened in 2011 and welcomes guests from 2012 on. It has basic field accommodation and welcomes foreign and national guests for research cooperation and educational purposes. The station includes an automatic meteorological station. The station is located at the southern margin of the forest tundraA type of ecosystem in which tree growth is limited by low temperatures. The origin of the word is from from the Kildin Sami word tūndâr, meaning "uplands" or "treeless mountain tract". In the northern... More zone. The area includes frozen and unfrozen peatlands and mires (discontinuous permafrostPermafrost is frozen ground that remains at or below zero degrees Celsius (32 degrees Fahrenheit) for two or more years. It forms in regions where the mean annual temperature is... More). Typically, the landscape consists of raised flat palsas, fens, raised bogs, and numerous lakes which are partly the result of thermokarstA landform that results when ground ice (ice-rich permafrost) melts. The melting leaves small, marshy hollows and hummocks in the land as the ground settles unevenly. See also thermokarst lake.... More. The higher parts, i.e. flat palsas, are underlain by permafrost. Between the palsas unfrozen fens and raised bogs (“ryam”) are present. Also some of the thermokarst lakes have been drained by thawing of permafrost and have changed into fen like vegetation. Numto Regional Park is famous for the high number of birds, both breeding and migrating species. It is a major stop-over area for migrating birds. The Numto Park Station is a site under development. 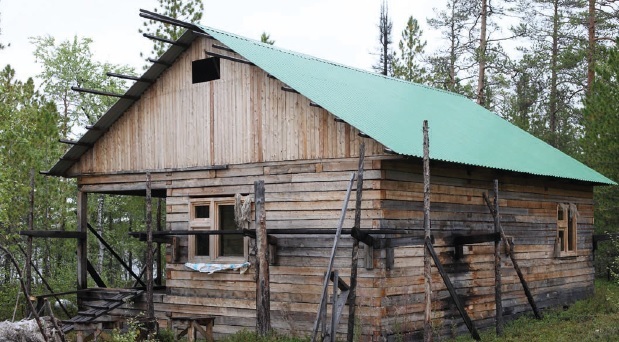 Staff from Yugra State University (including specialists in vegetation science, climatology, and land classification) is involved in setting up and developing the station. One major research topic will be the effects of climateThe average weather we would expect over a long period of time (seasons, years, decades). Climate varies from place-to-place across the Earth. Climate is determined by long-term (over at least... More warming and permafrost thawing on the frozen and unfrozen peatlandPeat is a soil type formed from slowly decomposing vegetation. It is found in wet areas where the lack of oxygen slows the breakdown of plant matter. Peatlands are areas... More ecosystems. Breeding and migrating birds as well as other faunaThe animals that live in a particular region, habitat or time (such as geological period like the jurassic). For plants, we use the term flora, and to collectively refer to all... More are being monitored by rangers of the Numto Regional Park. The Numto Regional Park has historical meteorological and faunal data. Small groups of indigenousBelonging to a certain place. Indigenous people are distinct ethnic groups that have historic connections to people who lived in a territory prior to the area being colonized or coming... More people live in Numto Village and in the Numto Regional Park where they fish and hunt. Few families herd reindeers in isolated areas. Numto Park Station is located near the small Numto Village, which can be reached by helicopter and 4WD car (snowmobile in winter). The nearest airports is in Surgut (200 km by normal and 100 km by dirt road). In winter, the station is easier to reach by winter roads. From the international airport Khanty-Mansiysk, the distance by helicopter is 260 km, by road 350-450 km (depending on the road). There is no summer road connection between the station and the nearest Numto Village.